Do you think that patience very important? For me, it is the key to success in our life. People with patience will set their goals and aspirations. They will plan what they’re trying to achieve and by when. On the other hands, a person who is lack of patience will hurry to get into action and see the result without first considering whether it’s the right way to do that. This will make everything tougher due to no definite plan to follow and you are wasting your time and energy. We all know that consistently going to improve our technical skills in our work will make us more knowledgeable and capable, but we must know that the results will only come after the hard work. If I knew that the working environment can provide us more opportunities to grow, then I will certainly put more effort, aim and achieve it. All I can do is try my best and hope for brighter future. The important is we should know our destination so that we can spot opportunities when they occur. Patience and perseverance goes hand in hand. If you are patient you will put more time in doing something before you start to reap the rewards. Thus, that’s the reason why the successful people will build their career with strong foundations to weather any storm. Just imagine if you are putting a lot of efforts on something for few months and no results has shown? Would you still keep going? Sometimes, it might take longer to see the results. All you need is to just have faith in order to continue working on what you believe in. This entry was posted on Monday, April 2nd, 2012 at 12:08 pm	and is filed under imDavidLee Life. You can follow any responses to this entry through the RSS 2.0 feed. You can leave a response, or trackback from your own site. 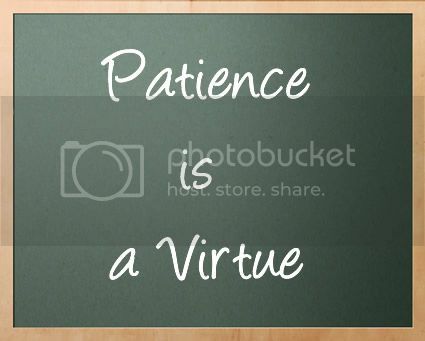 Patience is required in stock market. Can’t always expect to buy today and sell higher tomorrow.